The key to great bangs is picking the right style for you. If you were to diagnose me, you might say I have bang-nesia; otherwise known as too easily forgetting how awful it was to grow out blunt, straight-across bangs so I took the plunge once again during the height of a humid summer. Not my proudest decision. I wish I knew then how many different types of bangs exist, and that the key to the perfect fringe is picking the right type for your face shape. It can be the perfect accessory to make a major statement, soften features and complete your look. 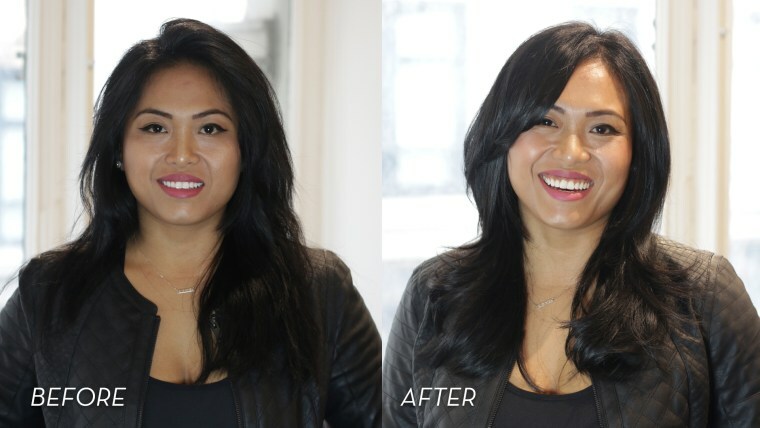 Whether classic, side, A-shaped or chopped, every face looks better with a bang, according to Edmondo Blando from Vanity Salon in Philadelphia. "The best time to experiment is winter," he explained, "they will grow out by summer." Ah, if only I could warn former me. Before saddling up to the chair, make sure you have an established relationship with your stylist. While bangs aren't tattoos, think of them as matte liquid lipstick. It's going stick around for a bit. If there's any personal advice I can dish, it's this: Don't trust any stylist who's willing to chop your fringe while your hair is wet. Wet hair is longer than dry hair and you'll only notice major shrinkage as you begin to blow dry. Oval: Your face is long and narrow — specifically, the length is equal to one and a half times the width. Round: Both your face length and width are equal; you may have a soft, round jawline. Square: The length of your face is approximately equal to its width; you may have a strong, angular jawline. Heart: Your face is widest at the forehead and narrower at the jawline. With this cut, Blando is drawing attention to Dilara Dogukan's eyes while lengthening her face. Straight-across bangs tend to add to the fullness of a round face, so a long, side-swept curtain bang creates a softer illusion. "Her texture was a bit frizzy, so length is key to allow for the hair to be blown out with a flat paddle brush," Blando explained. "Always ask for this type of bang to be cut 'feathery' so the hair is airy and will flow freely, versus a blunt cut that will not sweep as well," he added. This bang will not require upkeep and will grow out in 3-4 months without a trim. The goal for this haircut is to slenderize the face while keeping the focus on her incredible cheekbones. Go for long, heavy bangs, as seen here on C. Kai Touch. The cut balances her face with A-shaped bangs that graze both sides. "Razoring some of the layers allows for more movement and volume," he added. Oval face shapes have the most versatility, so Blando snipped Rachel Brodeur a classic, full fringe. Ask for bangs that hit between the brow and eyelash for the greatest impact. Whatever you do, don't neglect the rest of your cut! "Rachel has long, naturally red hair that did need some personalized long layers to complement straight-across bangs," said Blando. This stylish look needs no introduction, but it does require major upkeep; we're talking a trim every 3-4 weeks. Pro tip: Want your fringe to lay flat? Use a comb during a blowout instead of a brush! Crescent bangs are great for heart-shaped faces. This option, as seen on Nikki Mueller, is longer on the outer edges to soften a top-heavy, wider forehead. "The bangs should blend well with the layers ... this means more interior layers so the hair will have movement and blend to the longer layers," Blando said. Ask that bangs be tapered or thinned to the edges softly so they lay just right and aren't too thin. "These bangs do tend to split in middle or side which gives it an edgy feel, too!" he added. Remember that the hair grazing your face may cause more oil build-up than usual, but you can easily separate bangs from the rest of your hair, give them a quick wash in the sink and blow dry them quickly to refresh your look without a full wash. Bangs also tend to dry faster, so blow dry them first to avoid frizz and flyaways. Not ready to go out with a bang just yet? We love these face-flattering styles don't involve fringe.